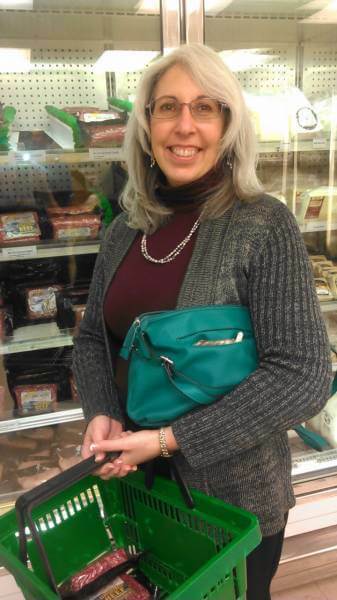 FAVORITE ITEMS TO BUY: Ground beef and sirloin, sometimes ground lamb or goat. DO YOU EAT DIFFERENTLY AFTER THE FIRST OF THE YEAR? No, not really. I don’t let the holidays influence what I eat. I know when enough is enough. I might have a cookie or two, but that’s it. SHOPPING FOR: I’m lactose intolerant so I can only have non-cow dairy products. I am trying to eat gluten-less – not totally gluten-free, but gluten-less. I feel better when I do that. FAVORITE RESOURCES FOR RECIPES: I’m a Food Network aficionado (both the TV channel and website.) I’m always looking for something new or different. I like Guy Fieri and his “triple D”: Diners, Drive-ins and Dives. That’s one of my favorite things to watch. We actually went to a place in Santa Fe that was on the show a few weeks ago. It was fun. It was called the Tune-up Cafe. It’s in a residential neighborhood, and they have really good food. I had the lamb burger with cheese on a homemade bun. They had great chili rellenos (my husband’s a big chili rellenos man.) All homemade, just good stuff. GO-TO RECIPE: I like making chili with RFD hamburger meat. It’s a simple thing, it’s nothing major, just crushed tomatoes, tomato paste, throw in some chilies and then a little chipotle, maybe some cumin, salt and pepper, to taste. It’s just really filling. I do it all the time. Sometimes I throw in corn. I used to add pasta, but since I’ve changed my diet, now I’ll put it over rice instead and add cheese on top.